Most of us find a slice of cheese very hard to resist. The tempting aroma and pungent taste of these delectable foods are enough to make any person salivate. Did you know there are more than 1,750 types of cheeses in the world? It’s true! They are differentiated by the type of milk it was made from, country of origin, age, tasting notes and uses. While you may have your favourites, there’s a good chance you’ve tried only a fraction of the available cheeses in the world. Let us have a look a look at just a few of them, and what you can do to make it even tastier. Mozzarella is a well-known cheese among all the pizza lovers (like me). This type of cheese originated in Campania, Italy and is made from cow or water buffalo’s milk. The best feature of mozzarella cheese is that it requires no aging to enhance its taste and quality. It’s produced by heating curd in warm water, followed by stretching it by hand and then it’s rolled into soft balls. Mozzarella is mostly used as pizza toppings or with pasta and salad. Originating in Somerset, England, this cheese is made from cow’s milk. Curds are cooked, then milled into rice-sized pieces. After that, they are pressed to remove the moisture. Cheddar can take about 9 months to 2 years to age properly. Colours can range from ivory, straw or dark yellow and is known for its balance of flavor and sharpness. This cheese is famous for adding taste to casseroles and grilled sandwiches. Roquefort cheese originated in France, and is known for its sweet and nutty flavour. Made from sheep’s milk, this cheese takes at least 5 months to age. It has a distinct look due to blue pockets of mold on its surface. It is famous for its richness and multilayered flavours. It can be eaten on its own, or you can eat it with nuts and honey. The best time to enjoy this moist cheese is when it’s made from early spring milk. The Greeks introduced Feta cheese to the world. This cheese is made with a minimum of 70% sheep’s milk and the rest with goat’s milk. It takes about 2-3 months to mature and has a squishy texture. The freshly pressed curds are soaked in salt water to produce this moist and tangy cheese. It’s paired best with summer fruits and is used in sandwiches as well as many Mexican dishes. It’s one of the oldest sponge-like cheeses, Taleggio originated in Italy. It contains nearly 40% fat and gets matured in about 10 weeks. This cheese is made with cow’s milk and is produced every autumn and winter. It is washed weekly with seawater to keep it fungus-free. Taleggio has a fruity taste and is paired best with Italian Nebbiolo wines. Clifton Paul Fadiman said, ‘Cheese – milk’s leap toward immortality.’ That quote pretty much summarizes how a cheese-lover feels about cheese when his/her taste buds first touch a delicious cheese slice. 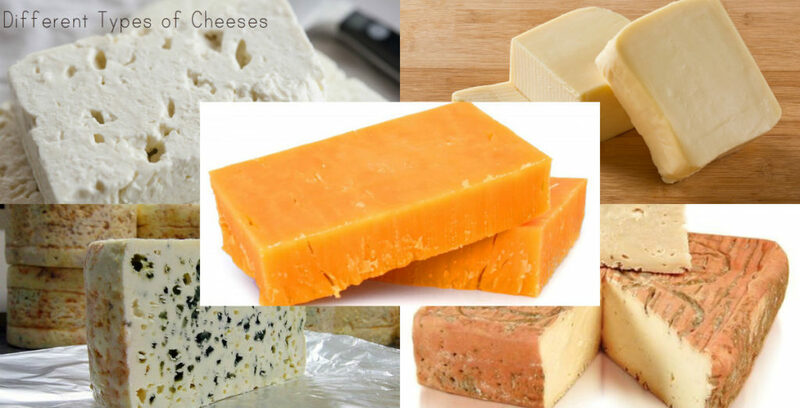 This blog post discussed a few different types of cheese. Now it is up to you to discover the rest of them and decide which one is your favourite.